Owners are often inspired by a dog’s physical appearance when choosing a name. Considerations like coat color tend to come in to play at decision time. While the shades vary greatly among breeds and individual dogs, there are some that stand out among the rest. Those with a red coat are some of the most common to receive color-based titles. This page contains red dog names coming from various themes. Popular ideas come from a variety of hues. Crimson, Scarlet, Copper and Maroon are a few shade-based choices. Some owners will find their pal to be more in line with a precious stone. Ruby and Garnet come from gems with related coloring. Many favorites can be classified as food and drink. Merlot, Shiraz, Zinfandel, and Cabernet are all red wines that are eager to lend a name. A variety of fruits including Strawberry, Cherry, and Apple also make fitting selections. Good ideas come from pretty much anywhere and everywhere. Each name in this list is related to the color red in some form or fashion. Enjoy this list of red dog name ideas derived from fictional characters. Ariel A fictional mermaid with red hair. She tends to get in trouble because she just can't stay 'under the sea'. Carmen Every gumshoe's dream is to capture the V.I.L.E ringleader Carmen Sandiego. But...Where in the world is she? Clifford The big red dog from children's books and cartoons. Dudley Dudley Do-Right and his trusty horse named 'Horse' will stop at nothing to catch Snidely Whiplash. This Royal Canadian Mountie had a segment on 'The Rocky and Bullwinkle Show'. Elmo The red Muppet and proud host of 'Elmo's World' on the children's show 'Sesame Street'. Flash A Marvel superhero with extreme speed and quick reflexes. Good luck catching the 'Crimson Comet'. Knuckles The red spiney anteater from Sega's 'Sonic the Hedgehog'. He uses his spiked hands to protect the Master Emerald. Mario Luigi's brother that seems to have an endless supply of red shirts and hats. Your go-to plumber in the Mushroom Kindgom. Maximillian Dr Reinhardt's number one in Disney's 'The Black Hole'. His goal is to destroy V.I.N.CENT. McQueen A race car from the Pixar animated film 'Cars'. Lightning McQueen looks like a Mazda Miata and sounds like Owen Wilson. Raphael The ninja turtle with the red bandana. Wields the sai. Craves strange pizza. Stimpy 'Oh, Joy!' A fat red and white cat that likes to create destructive electronics. Pour yourself a glass of red wine as you enjoy this list. Barbera Similar to Merlot. Pairs well with tomato sauces. Cabernet A globally common red wine made from Cabernet Sauvignon grapes. Claret Red wine from Bordeaux in France. Malbec A Bordeaux region red wine. Pairs well with meats. Merlot A soft red wine that is a great introduction for new wine drinkers. Sangria A popular Spanish drink made with red wine. Shiraz Or Syrah. A very dark red wine that pairs well with meats. Zinfandel A robust red wine that pairs well with pastas and tomato sauce. Why it's a red dog name? Is your new puppy a boy? Check out our list of male dog names. Is your new puppy a girl? Check out our list of female dog names. 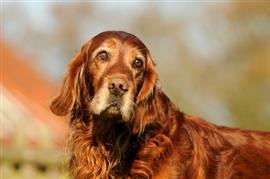 Do you have a dog with a reddish colored coat? We would like to have a picture. Share your dog's name and image at the bottom of this section. Meanwhile, enjoy these red themed images submitted by our other visitors. Some of our pages will contain a subcategory. A subcategory is a slightly more specific grouping than the main topic of the page. For a subcategory, we will include a separated table of names and corresponding descriptions. An example of a subcategory of Red Dog Names would be 'Dog Names Inspired by Red Wines'. If you have any subcategory ideas for the Red Dog Names page, we would love to hear them. Use the form below to submit your ideas.